By Jennifer Burcke on June 25, 2012 Visit Jennifer's Website. Last Wednesday, the first day of summer officially arrived at 1840 Farm. In New England, bidding a final farewell to the previous winter and the mud season that follows is an annual tradition. I normally feel the need to celebrate the arrival of the heat. Without the hot summer temperatures, I would never see my beloved heirloom tomato season come to fruition. This year, I found myself begging for mercy. 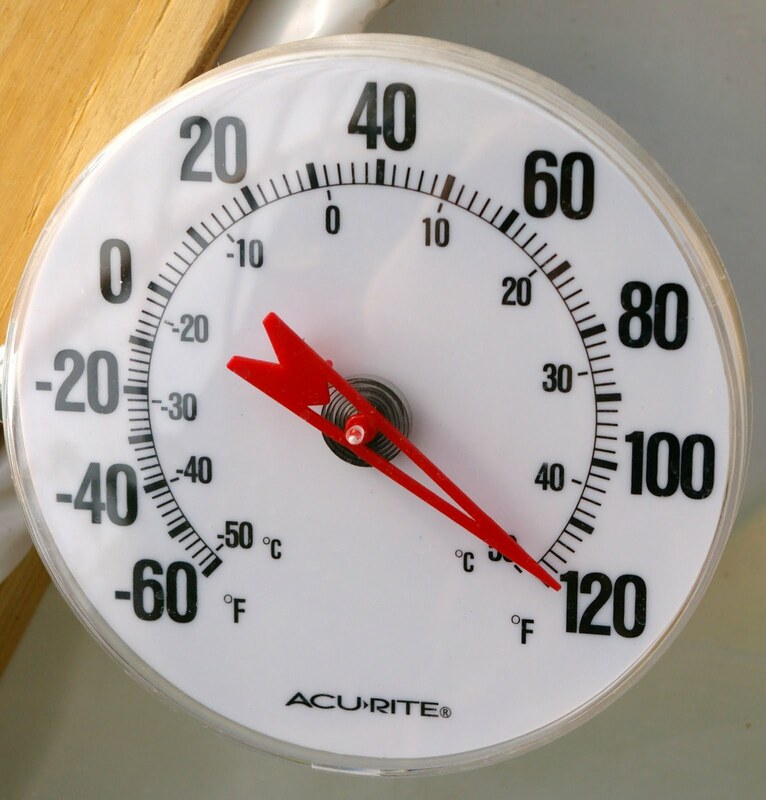 We rang in the new season with three successive days of temperatures over 90 degrees accompanied by unbearable humidity. I know that we were not alone. One look at a national weather map left me literally seeing red from sea to shining sea. I wasn’t the only one dissatisfied with the temperature. Herbert Menninger, our French Angora rabbit who wears a permanent winter coat, was not at all amused. Our Miniature Schnauzer took the heat as an invitation to pass his days sleeping on the sofa. When invited to go outside, he would simply sigh, get comfortable and take another nap. I couldn’t blame him. Our three Nigerian Dwarf Goats found a shady spot in the doorway of their barn stall and waited for the heat to abate. Zinnia, who was born on our farm last October, seemed to be wondering what we were doing to make it so hot outside. It was her first real taste of summer heat and she didn’t enjoy it one bit. Our newest chicks are now 2 months old. They didn’t seem to notice the heat at all. They went about their daily activities and chose to spend the bulk of their time playing outside in the shade. They enjoyed cold treats each afternoon and seemed to be the least affected by the sweltering temperatures. Our flock of adult heritage breed hens has already lived through one summer. They have literally earned their wings. In fact, we had a heat wave last July when the temperature soared to such heights that the plastic skin on our hoophouse split down the middle in protest. While they have endured high temperatures before, the hens weren’t any happier to see them come visiting last week. They were, however, happy to see me visit with chopped fruit popsicles and frozen berries each afternoon. Cold chunks of watermelon didn’t stand a chance when they were placed in their run each morning. We’ve had good success helping our hens beat the heat by cooling them down from the inside out. They happily eat any cold treat we bring their way on a hot day. 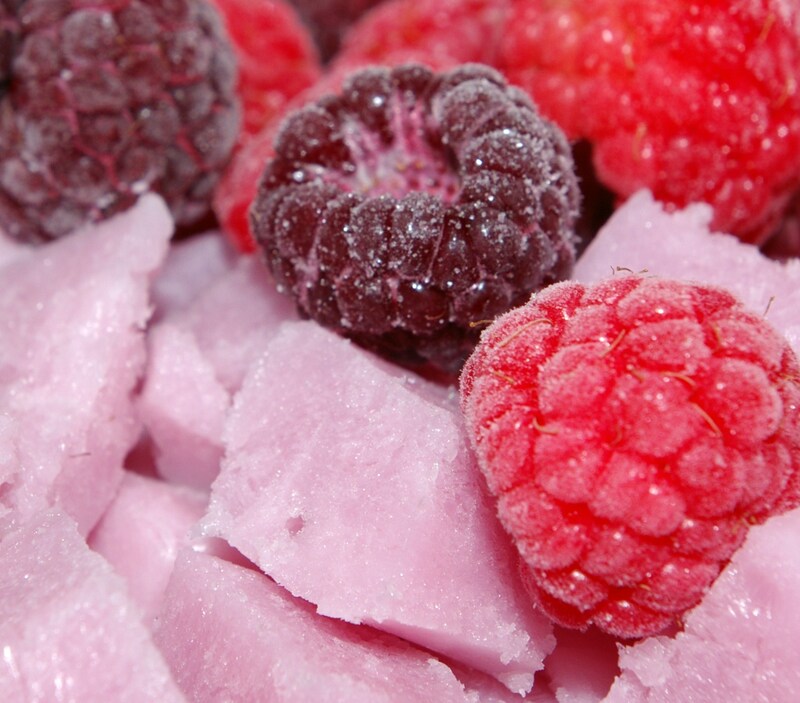 Their favorite cold snacks are icy watermelon chunks, chopped fruit popsicles, frozen blueberries, and frozen yogurt. If bits of frozen strawberry yogurt hit their bowl, a free-for-all ensues. When the temperature soars, we also refresh their water multiple times each day. They much prefer drinking fresh cold water to the water that has been hanging in their hot coop all day. I can’t blame them. In fact, I’ve been known to add a hefty dose of ice cubes to their water along with apple cider vinegar when doing my morning chores on an especially hot day. When fresh, icy water is available, our hens line up to have a cold drink. In addition to cold treats and ice cold water, we help our hens endure the heat by maximizing the cooling exchange of fresh air in their coop. In my post detailing five features of the 1840 Farm coop that you could incorporate into your coop planning, I highlighted proper ventilation. I feel strongly that fresh air is critically important for our chickens to be in optimum health. We infuse our coop with as much fresh air as possible by utilizing the principle of cross ventilation. We gave careful thought to ventilation when we were planning our coop. From the beginning, we knew that we would be repurposing a window that we discovered in our barn. We also knew that one window alone would not be able to provide enough fresh air for the coop. The coop is no different than our farmhouse in that respect. Opening one window in the house just doesn’t provide enough fresh air on its own. If I open a window across the room from the first, a lovely breeze suddenly begins to flow. As the fresh air comes in, warm air inside the house exits out the opposite window. Voilà: cross ventilation. It was clear that we needed to use the same strategy in the coop. With this in mind, we decided to place a vent on the wall opposite the window. Unfortunately, we didn’t have another window on hand, so we needed to be creative. We looked through our remaining coop building materials to determine what could be used to create the airflow we were looking for. We had disassembled an old vanity and used its components to build our nest boxes. There were a few pieces leftover from the nest box construction. 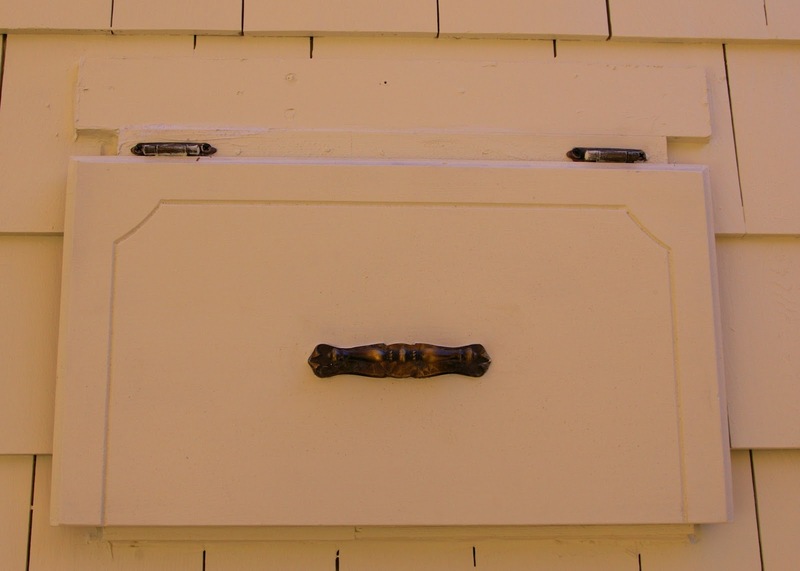 One of the remaining pieces was a solid wood cabinet door with the hardware still attached. In minutes, we knew that we had found the new vent door. By using the existing hinges, it could be lifted up in the summer and lowered in the winter. The drawer hardware was moved to the center of the door and the door was trimmed to fit. 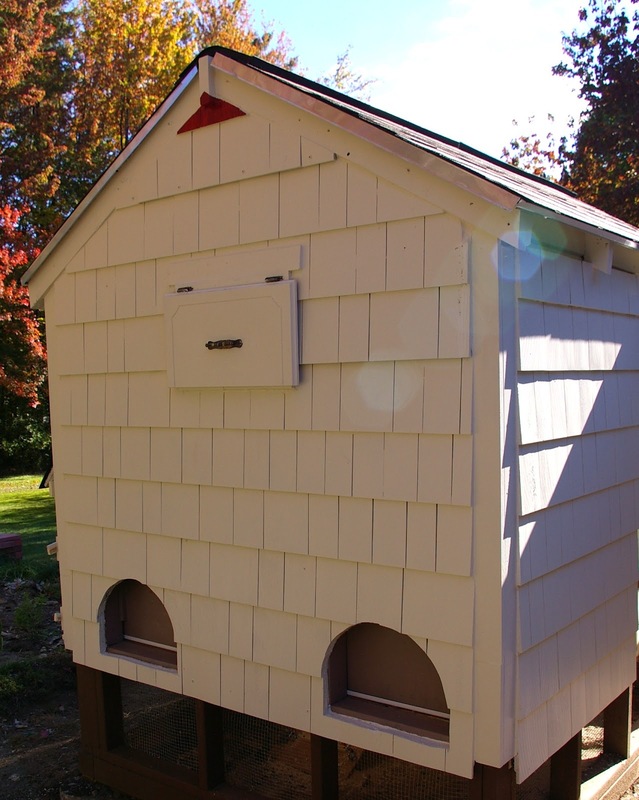 A small piece of wood attached to the coop could be adjusted to keep the vent fully open in the summer and slightly ajar in the winter. We painted the door and located the vent on the wall directly behind the roost. We attached hardware cloth on the inside of the coop to keep the predators out and the hens in. When the vent door is opened, it gives our girls a steady supply of fresh air day and night. 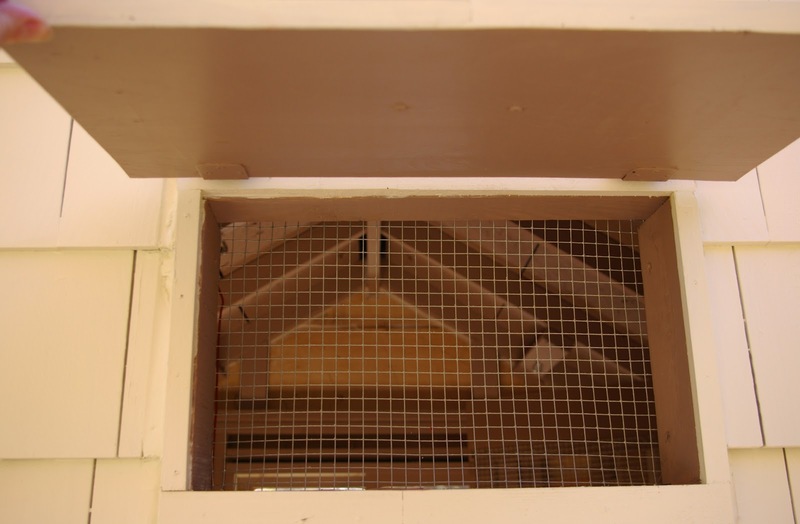 During the day, the hen’s access door is also open to the outdoor run, providing a secondary vent on the rear wall. To increase our chances of capturing as much fresh air as possible, we also installed a screen door. My father constructed the door frame from wood that was painted to match the coop before hardware cloth was attached to the inside. 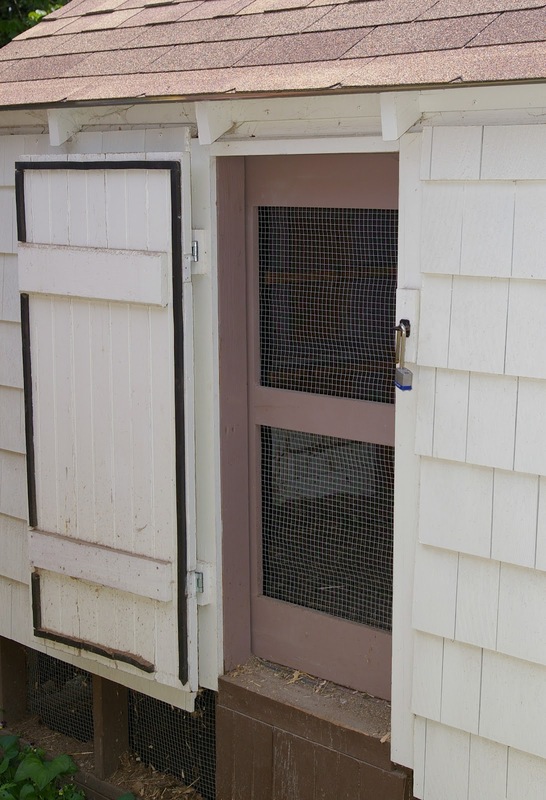 During the warm months, the exterior door of the coop can be latched open to allow more fresh air to enter the coop while keeping our hens safely enclosed. Together, the window, vents, and screen door allow hot air to escape the coop as cooler, fresh air enters through the window and screen door. While I can’t control the temperature outside, these features allow us to keep our hens comfortable during the summer. When the temperature rose above 95 degrees last week and the sun was blistering everything in its path, the coop remained a much more hospitable 82 degrees. By comparison, our circa 1840 barn was 93 degrees long after the sun had gone down. Our hens spent most of their day outside in the shade, but still returned to the coop to lay a full dozen fresh eggs over the three-day period. If I ever find myself in the position of planning the construction of another chicken coop, I’ll be sure to include at least one window with an opposing vent, as well as a screen door. In the meantime, I’ll make sure that there is a fresh supply of watermelon, popsicles and frozen yogurt at the ready for the next heat wave. 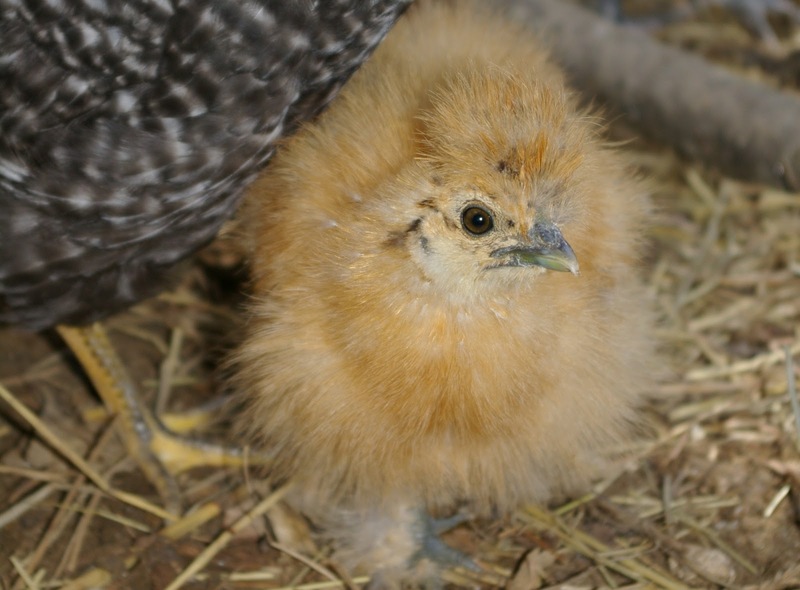 How do you keep your chickens cool in the summer? I’d love to hear your tips and tricks for helping your flock cope with the heat! We have very warm but not obnoxious summers even at 7200ft, but aridity is a major problem as well. So we run misters through the fencing along our coops and keep a slow mist of water running on really hot days. Keeps the yards dust-free and the chickens, several breeds, love it. The coops all have vents and are on the shady side of a large building, which also protects the coops from winter winds. We also use box fans if absolutely have to. I always make sure my free range chickens have damp earth go dust in. I Iet their water overflow very, very slowly (just a drip) and it gives them cool, moist dirt to dust in. They certainly take advantage of it! We have always used Apple Cider Vinegar in the drinking water for our animals. It is thought to help boost the immune system and support them in times of stress (hot weather, illness). It also helps to keep bacteria from growing in the waterer which I find especially helpful when the temperature soars! There are so many other benefits that they are too numerous to mention here. 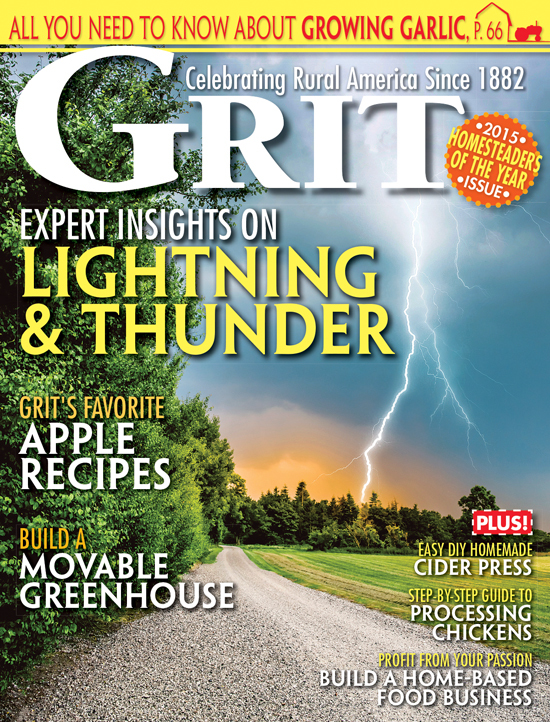 I think you may have just inspired a future post on the benefits of Apple Cider Vinegar! Dr, Elizabeth, I have read that if you add 1-4 Tablespoons of Apple Cider Vinegar to 1 gallon of drinking water, it will help the chickens in times of stress, hot weather, and also assist in diminishing their pecking of other flockmates. For about $7 I purchased a misting device from the local chain hardware store. It is a firm but bendable hose with a mister on one end and a connection for a garden hose on the other. I hang it over a tree limb and turn it on low. The mist drops the temperature about 20 degrees, and the girls gather under it, in the shade, for most of the day. They prefer to be there than out in the pasture during their late afternoon “free time.” It also helps the tree survive the drought and heat. Why add apple cider vinegar to the water? Does that increase water consumption? THanks in advance! 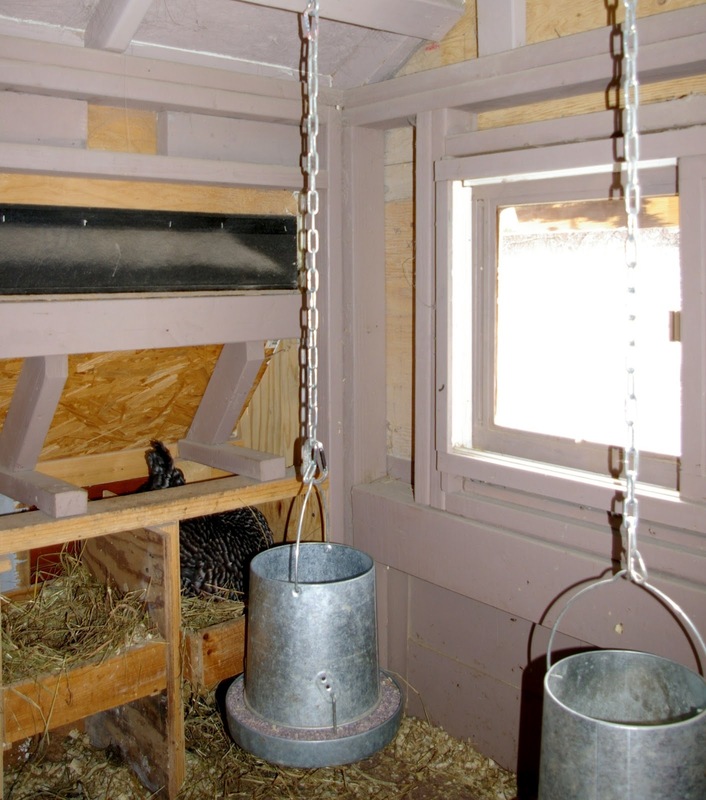 When we built our hen coop a couple of springs ago, we also decided to utilize cross ventilation to keep them cool. We set the coop to take advantage of prevailing winds, which in summer, are usually only a very light breeze. It frequently passes 105* in our part of California, so on very hot days, I place a sprinkler on the roof of the coop and turn it on for half an hour. The cool water flowing over the roof and down the back of the coop brings the temperature down a full 10 degrees inside and keeps the chickens much happier. We also like giving them watermelon and frozen fruit. I add ice cubes to their water all day. I insulated my tractor’s house well, and I added 4-way cross ventilation. The pop hole vents to a window on the opposite wall that’s high up. The side walls both have windows too, and they are set in different places in the walls to improve ventilation. For winter, I’ve got plexiglass inserts. Today I’m going to try freezing a jug of water and leaving it in the house to thaw and, hopefully, provide some relief. When I tossed out some ice cubs where they were napping yesterday, they didn’t get it at first. Then Bessie, my biggest hen, settled right down on them. Her nickname is Fat Bessie because, well, she is. She’s a huge Buff Orpington. My petite Speckled Sussex, on the other hand, barely seems to know it’s summer.